Patrice Bonnafoux: Hi Rachel, so you're the project micromorphologist, could you tell us what is micromorphology? Rachel Kulick: Micromorphology is an approach to studying intact soil/sediment samples using microscopic techniques. The purpose is to identify the different soil/sediment parts and other contextual materials (like pieces of human-made tools -yes, it was not only the men, fragments of food, etc.) and to recognize the relationships between these components. The goal is to understand the natural and anthropogenic processes that have made a site what it is today. 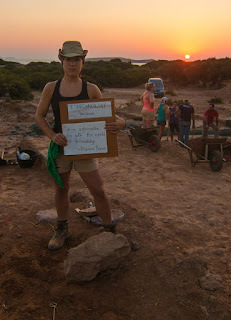 Patrice Bonnafoux: How is it helpful for archaeologists? What questions can micromorphology answer? Rachel Kulick: Understanding context is really important for archaeologists. While archaeologists are able to identify some clear contextual features in the field, such as surfaces, pits, burning events, etc., many other features are not visible to the ‘naked eye’ during fieldwork. Micromorphology is one method through which archaeologists can understand these missing contextual pieces that can explain how a site was formed, used, and changed over time. Patrice Bonnafoux: How, in practice, do you operate (starting in the field and then in the lab)? In other words what are the different operations? Rachel Kulick: In order to take samples for thin section micromorphological analysis, undisturbed soil/sediment blocks (in the form of rectangular prisms, about 5 cm x 5 cm x 10 cm) are taken from the archaeological site. I try to sample the context of archaeological interest as well as the surrounding contexts which serve as comparative controls. Prior to removing sediment blocks, the contexts are drawn on site plans, photographed and the coordinates (including depths) of the blocks are recorded. The soil blocks are carefully wrapped with protective material, often plaster, for transport to a laboratory. In the laboratory the blocks are impregnated with resin, mounted on glass slides, and then cut with a special saw to a thickness of 30 μm, which permits their viewing underneath a microscope. 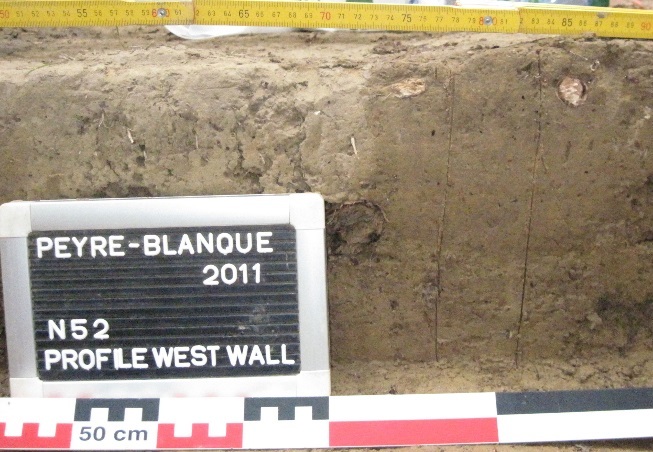 In the image above, the photo on the left shows a recent root system present in the middle of a channel in (right) section PB5 from sampling in 2014 (section is 5cm in width). This demonstrates a combination of bioturbation (reworking by animals and plants) and the movement of water through this context. Patrice Bonnafoux: Can you tell us more about your specific work at Peyre Blanque? 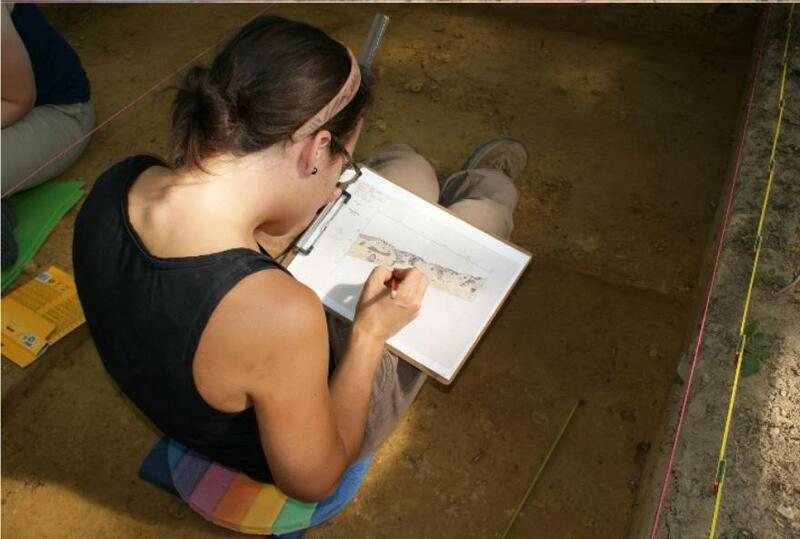 Rachel Kulick: At Peyre Blanque, I’m using micromorphological analyses to investigate the possible anthropogenic activities that may have occurred at the site and the processes that may have affected the current state of the site. What was the depositional environment of the construction of stones and artifact layers? Were the sandstone slabs and lithic artifacts originally arranged as part of a single, continuous (or multiple) occupation(s)? What is the extent of stratigraphic reworking at the site? How have current or past taphonomic conditions preserved, or destroyed, certain types of artifacts? Patrice Bonnafoux: Come on, give us a bit more. What do your preliminary analysis suggest? Rachel Kulick: Presently, the micromorphological evidence is giving us clues as to the post-depositional processes and activities that have influenced the site sediments and surface features. Evidence of bioturbation is apparent throughout the thin sections, as well as is evidence of the hydromorphic (water-saturated) nature of the sediments, which is more prevalent in certain site areas. Some size-based sorting of the mineral grains indicates water-induced sorting and some low-energy downslope grain movement. Also, some unique clayey features and iron/manganese nodules could suggest the preservation of ancient sediment materials on site. Patrice Bonnafoux: How long have you been working with the project? Rachel Kulick: I’ve been working with the project in various capacities since 2007 (8 years!). Patrice Bonnafoux: How did you get involved with Peyre Blanque project? Rachel Kulick: I first joined the Peyre Blanque project in 2007 when I was an undergraduate student at Cornell University. I had just completed a course on prehistoric Europe, taught by Dr. Kathleen Sterling, and I was eager to see a paleolithic site in person. I began the micromorphology research in 2011 under the guidance of Dr. Paul Goldberg. I think it speaks to the excellent organization and quality of the project that so many project participants, myself included, have been returning to excavate site, year after year. Patrice Bonnafoux: What are your plans for the future? Rachel Kulick: In terms of future work at Peyre Blanque, I hope to focus my upcoming research on the origin of the site sediments and other site formation processes. Combining results from thin section analysis with geochemical analysis in the coming year will potentially lend additional information on the occupation of the site and the relationship between the anthropogenic activities and post-depositional processes. Peyre Blanque provides a truly unique opportunity to study an area that has experienced overall stratigraphic stability since its Magdalenian occupation. Hopefully, I will have opportunities to micromorphologically study other contemporaneous sites from the region. Rachel Kulick is PhD Student in Anthropology at the University of Toronto. 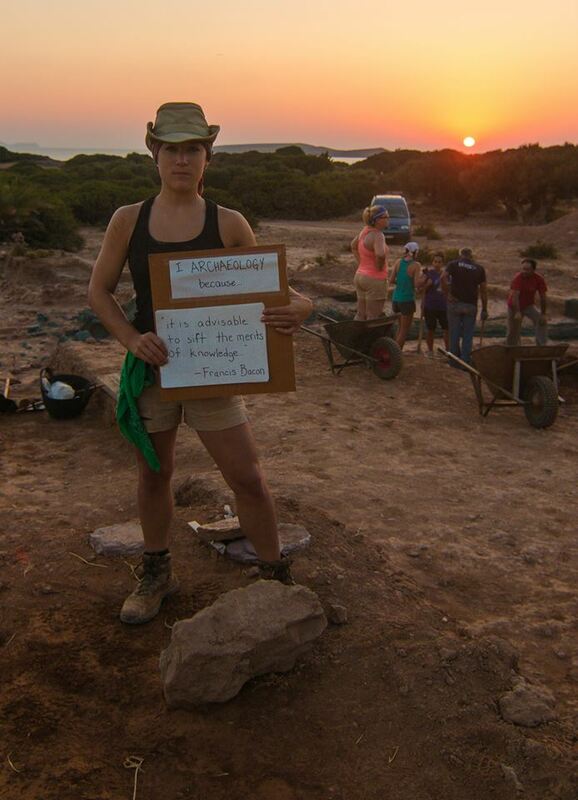 Her main research interests include Aegean and east Mediterranean prehistory, geoarchaeology (specialization in soil micromorphology), archaeological science, and viticulture and olive oil production and consumption. Glad you liked it. Stay tuned for more to come!